As the economy returns to growth, the jewellery industry in particular is a sector that has emerged changed immensely. When global markets and currencies fluctuate, investors divert their investment and seek safe havens such as gold and other metals. As a result, spot gold has doubled in price in the last ten years. TJH Ltd. is an Irish family-run business based in Dublin for over 65 years. One of Ireland’s longest established manufacturers and wholesalers, their customer base is mainly the Irish independent retailer. For over 30 years, they have also been distributing in the UK and US, servicing the Irish diaspora. They have had lots of success over the years with their gold and silver Celtic design and contemporary collections. In recent times and key to their success, they have also innovated with more modern designs to appeal to a wider audience. Even before the financial crash, the market was changing. In my early days as a retailer of jewellery, watches were the only products where branding was essential. Jewllery has since moved on from being an heirloom purchase to a fashion item in it’s own right. And as the proliferation of brands escalated in the clothing world, this sector followed a similar parralel. Now almost 90% of the fine jewellery market is driven by brands. Customers want affordable luxury. With changes in fashion trends and increases in precious metal prices, the ‘take-away’ jewellery market exploded. Fast fashion retailers responded by introducing high-fashion jewellery with little or no precious metal content, facilitating a low price accessory market. This had the added impact of expanding the competition. Nevertheless, fine jewellery is still seen as a treasured gift to celebrate special occasions. The challenge for TJH is to find a way to stand out and compete in a morass of international brands. Millennials too are an important growing customer segment now and for the future and their buying motives are strongly influenced by provenance. In this case that means ethical mining and care for the environment. Having supported Geneva-based deGrisogono, a high-end luxury jewller, I have seen first hand what it takes to build a global jewellery brand. It always starts with a great product idea, a well-considered plan and a budget. TJH astutely created an amazing USP (unique selling point) by securing their exclusive licence from Galantas Gold Corp. who operate the only commercial gold mine in Ireland. Imagine the potential in that – where the diaspora can literally buy a piece of the ‘old sod’ to cherish and pass through the family for generations? 1. Conduct lots of competitive research to establish a target market, with design ideas and solid routes to market. This doesn’t have to cost money. Go and book time with several customers and seek their input. They’ll be more than happy to support you. 2. Decide your market positioning (TJH developed an exclusive range of contemporary Irish and fashion-led pieces to fit with that. 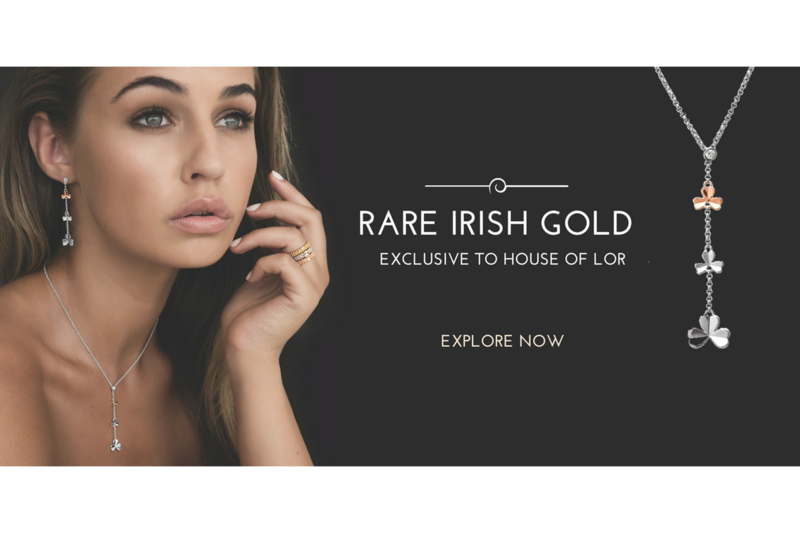 They also introduced pieces made from a combination of rare Irish gold and sterling silver to create affordable luxury). Where do you see your pricing compared to the competition? What level of quality and design will make you different enough? 3. Establish a relevant brand name, logo and tag line (possibly seeking external help from a design agency for objective input). This should be consistent across all collateral. 4. Build a content marketing plan and ensure a consistent message across all communications and channels. Social media is of course an inexpensive and powerful way to build brand awareness. (House of Lor is a collectibles range, and therefore cleverly prompting repeat purchaes). 5. Work in partnership with all stakeholders to get your brand out there, both through the trade and on-line if you can. 6. Support your trade partners to sell the product out of their stores. This will involve great marketing collateral and training for the retail salespeople. It’s easy to motivate them to sell your product when you engage with them and share your story. When they know the heritage, the features and the benefits of your product, they will sell more. 7. Execute your plan and track all progress and feedback carefully. Then take corrective action as you go. Make no mistake – it takes years to build a brand. The steps here are not intended to be the definitive list but they’ll illustrate that there is a science to it. The steps are iterative, as you may find yourself imagineering a brand name and logo for example, before you finalise product designs. Each step is critical though and cannot be overlooked. TJH are now five years into building House of Lor. Already they have made changes to product design as they monitor what pieces sell better than others. They are now well placed as they head in to peak Christmas trading season. At the same time, they are preparing to exhibit at Showcase, where they’ll be inspiring their international retail customers with an amazing point of difference.